I’ve asked my Facebook friends what sort of recipes they would like to see this summer and the response was no bake! 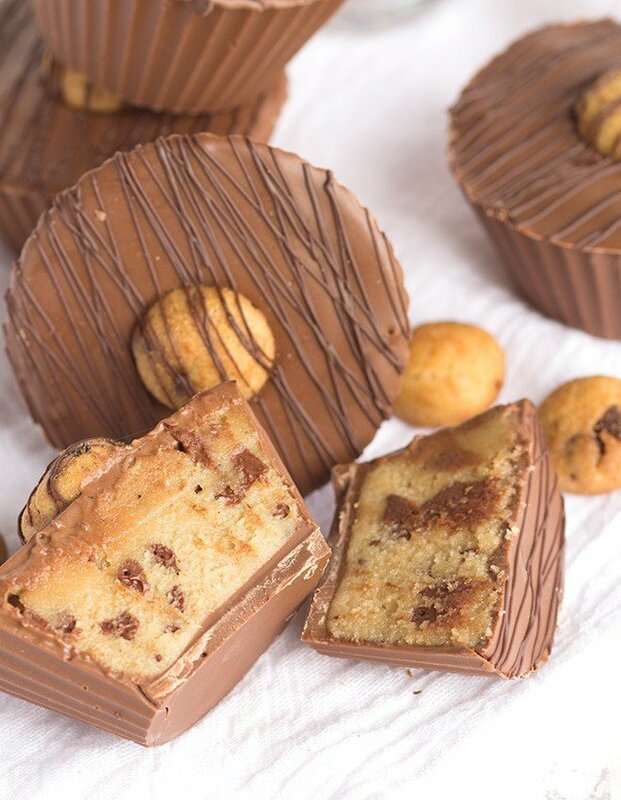 No bake it is with these cookie dough cups. My all-time favorite cookie dough is chocolate chip cookie dough. The brown sugar and butter combination is my weakness. Each of these cups is packed to the tippy top with cookie dough. Yummmmm! The cookie dough isn’t meant to be baked into cookies. Don’t bother trying, it would be a ginormous fail. There’s no egg in them and is perfectly safe to eat raw. I’m one to eat the raw cookie dough that’s meant for cookies too, eggs and all. It’s never hurt me, but it’s definitely not recommended. Don’t do what I do! 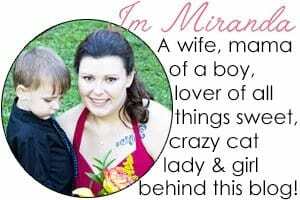 My husband is crazy about things like this. I think I heard him gasp when he realized I eat cookie dough with eggs in it. Melt 1 and 1/2 cups of the milk chocolate candy melts in a microwave-safe bowl for 30 second intervals and stir afterwards. Do this about 3 times until the chocolate candy melts are completely smooth and melted. Coat the sides and bottom of silicone baking cups with the candy melts. Make sure there are no holes on the sides. Let dry for about 10 - 20 minutes until firm. 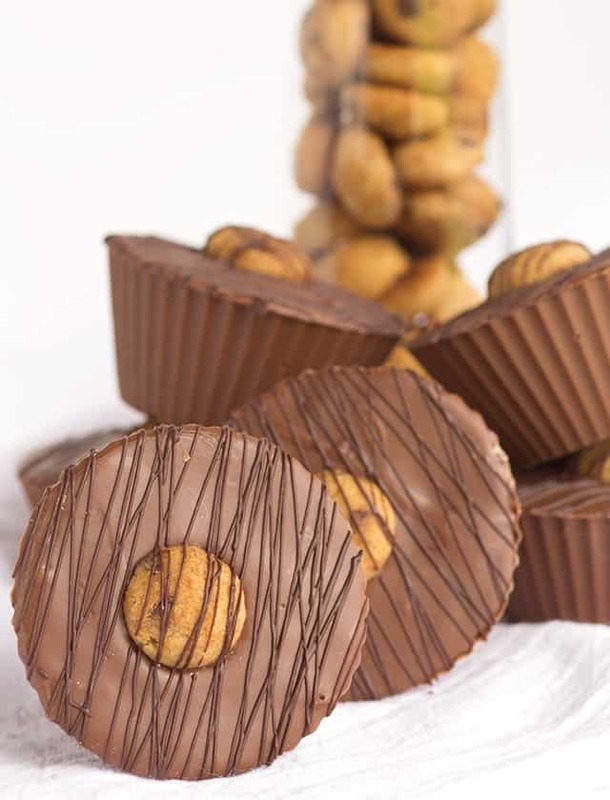 Add another layer of chocolate on the sides of the silicone baking cups so the sides are slightly thicker. Let dry for another 10 - 20 minutes until firm and start making the cookie dough. In a large mixing bowl, add in the butter and brown sugar. Mix with a hand mixer on medium speed until light and fluffy. Add in the vanilla bean paste or extract, milk, and flour. Mix with the hand mixer on medium and well incorporated. Using a spatula, stir in the mini chocolate chips. 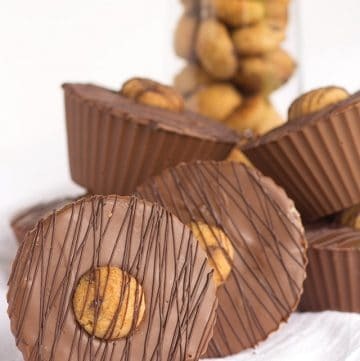 Fill each chocolate coated silicone baking cup with the cookie dough. Carefully push it into the cup without breaking the chocolate shell. Heat up the remaining 3/4 cup of milk chocolate candy melts by microwaving 30 second second intervals and stirring. Microwave 2 - 3 times until the candy melts are smooth and melted. Place the candy melts into a sandwich bag. Cut a small hole in the corner of the bag. Pipe the chocolate to cover the cookie dough. Give the cup a gentle tap to have the chocolate settle into the cracks. Pipe a little more if needed. 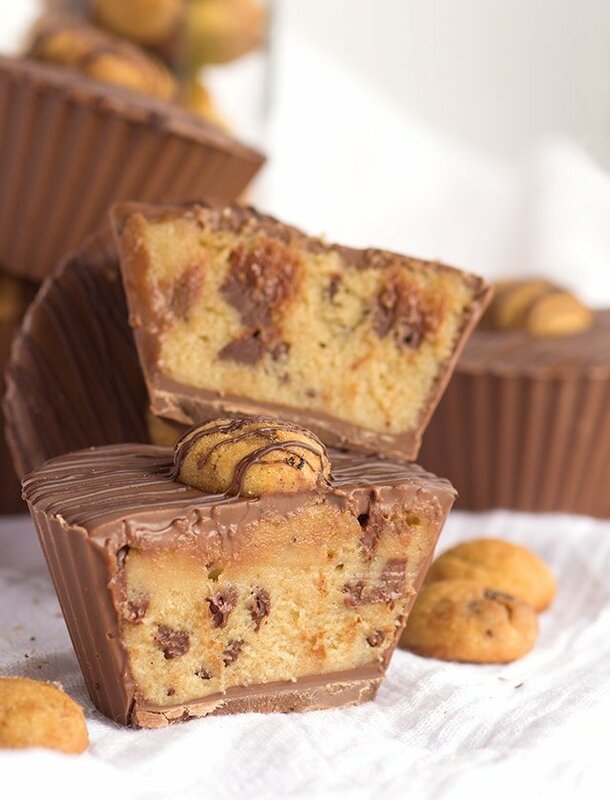 Quickly add the mini chocolate chip cookie to the top of the cup before the candy melts firm up. Melt the dark chocolate candy melts in a microwave-safe bowl for 30 seconds and stir. Repeat and stir until smooth. Add the melted dark chocolate candy melts into a sandwich bag. Cut a tiny hole in the corner of the sandwich bag. Move the bag back and forth quickly. If you move quick, you won't get any drips or ripples in the chocolate drizzle. Let dry and remove from the silicone baking cups. I store the cups in the fridge. All I can say is WOW!! You have a winner here! I’m glad you love the recipes! You can use chocolate chips or baking chocolate instead.